It's been a while since I wrote up an Aldi trip. I'm not happy to admit that we let our house sale get to us. The random showings and stress prompted us to get far more takeout than usual, and our budget got fairly off track. This week we vowed to change our ways. 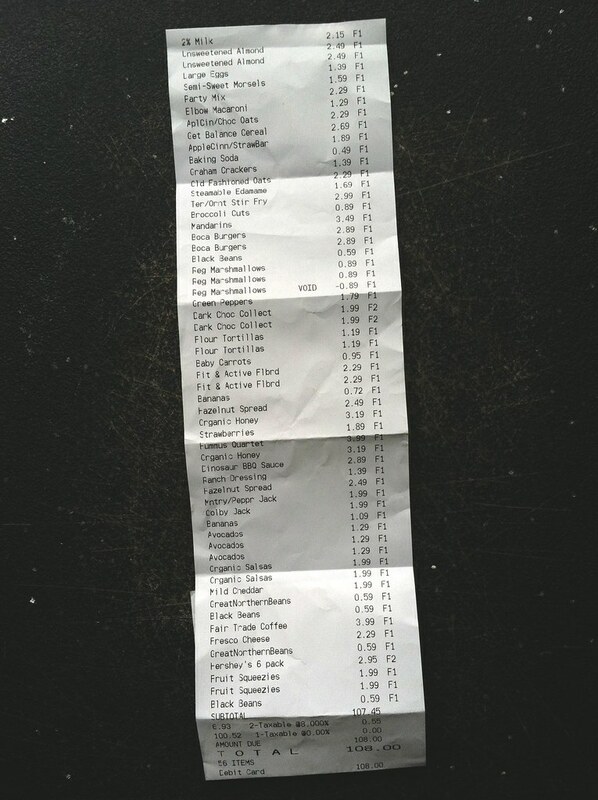 So, we headed to the store last night -- list in hand. I was amazed at what we got for just around $100. No. I don't think it's cute that Ada's standing on the packing counter. We made the mistake of shopping right around her dinner time. Tantrums abounded around every corner, and I don't blame her one bit. I was also hungry, which is probably why we bought more than I intended to despite bringing a list. Anyway, we even opened a package of cereal bars to give her as we put our food in the boxes. Made a big difference. Yes, you see s'mores stuff in the cart. I couldn't resist. It calls to me this time of year. But here's a list of what we purchased. It's hard to make everything out. I was shocked to find two types of Boca burgers in the freezer section, so I snagged them up immediately. We stocked some beans along with all the stuff to make Veggie Loaded Quesadillas. We bought Ada her fruit squeeze packets, I got some hazelnut spread, Stephen grabbed his favorite coffee. Lots of chocolate, too. I haven't had sugar in the house for several weeks -- so it was an overdue purchase. New stuff we're trying: Edamame, the Boca Burgers, broccoli cuts, "party mix" which is basically Chex Mix, cereal, graham crackers, new hummus flavors, dressing, cereal bars (like Nutrigrain), and I think that's it for this time around. Certainly found different stuff in the couple weeks we didn't shop there. In a way, I like the change in variety. On the other hand, I couldn't find a couple things I wanted that were there a little while ago. We weren't happy to see avocados jump in price from well under $1 to $1.29 a piece -- wondering how long that will last. You will see that I got some unsweetened almond milk. Despite the whole carrageenan debate, you guys sent along some info about the differences between types of carrageenan. Obviously make your own decisions, but I'm wondering if it's not as big a deal after all? I guess you could say I'm still super enthusiastic about shopping at Aldi even after the whole honeymoon period has worn off. I get nervous about spending too much at the store, but time and time again I'm able to pack our cart to its capacity and meet our budget. 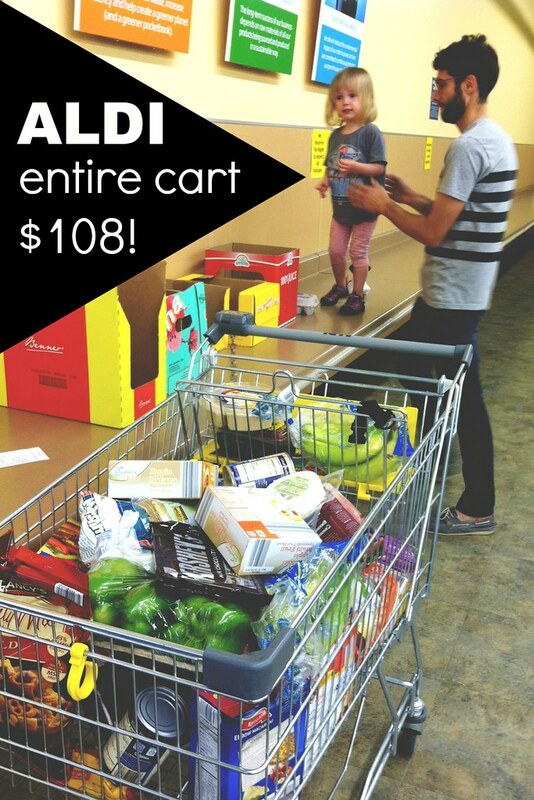 Of our $150 budget (that's two weeks combined, $75/week), we still have $42 for next week.